The foot bars are a must-have accessory for gamers. Compatible with the 3dRudder Black & Red edition for PC & VR. 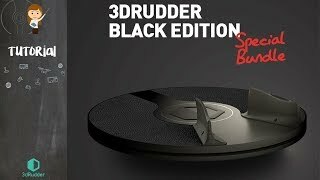 The foot bars are compatible with the 3dRudder for PC & VR (Black & Red edition). The parcel includes a pair of foot bars, assembly instructions, 4 screws and a screwdriver. Installation takes less than 5 minutes. Watch the video for more information.